The NBA trade deadline is Thursday afternoon, so we assembled FiveThirtyEight’s resident basketball writers — plus editor-in-chief/trade machine troll Nate Silver — to bandy about some, um, creative trade ideas for LeBron James and the Cleveland Cavaliers. Sure, James says he won’t waive his no-trade clause. (He says a lot of things.) But if LeBron somehow does assent to a deal, should the Cavs think about trading him? The transcript below has been lightly edited. neil (Neil Paine, senior sportswriter): We are all gathered here because FiveThirtyEight editor-in-chief Nate Silver had a very hot NBA trade deadline take that he needed to get out into the world. Nate, what is your idea? natesilver (Nate Silver, editor in chief): I think the Cavaliers should trade LeBron James. natesilver: I think the Cavaliers are a dumpster fire right now, and their trade options aren’t very attractive because their second- and third-best players are at the bottom of their market value (because of an injury in Kevin Love’s case). And I think it’s too risky to trade Brooklyn’s No. 1 pick when there’s a good chance that LeBron leaves anyway this summer. So it’s maybe their least-worst option. kyle (Kyle Wagner, senior editor): Disagree, vehemently, but also I have a muscle emoji trade proposal for if they do, so willing to hear this out. natesilver: I’m assuming they can get something pretty good, though. chris.herring (Chris Herring, senior sportswriter): Funny thing is, I think Love’s value would have been pretty decent now had it not been for his injury. neil: So this notion implicitly assumes that the Cavs have no chance this year and should just wave the white flag on the season. Is that fair for a LeBron-led team that has won the East three years running, even given how bad they look right now? chris.herring: But this dumpster fire does feel fundamentally different from the past midseason lulls. chris.herring: I guess it comes down to this: Yes, it would be devastating and perhaps crippling to lose the guy for nothing. At the same time, don’t you have to be 100 percent sure that he wouldn’t come back before you deal him? According to our projections, the Cavs have a 16 percent chance of reaching the finals again and a 5 percent chance of winning the title. And that’s with giving them a huge post-season bonus that assumes they’ll be a much better team in April than they are now. Assumption 1: The Cavs are still a lock or a heavy favorite to advance out of the East. This is not a certainty! But I’m still having a very, very hard time taking Boston and Toronto at face value. Assumption 2: If a star Warrior is injured, the Cavs, as currently constructed, can beat that team, or at least be competitive. Assumption 1 gives you certainty: For the same reason that teams’ championship odds go WAY up once they advance a round and the other teams in the pool are still locking up their series, being chalk for the finals gives the Cavs a huge edge — if we think that’s still true. Assumption 2 is more important, though: If we think it’s true, it means their win-condition has not meaningfully changed. The Cavs were never going to compete with a full-strength Warriors team. They may have thought they were, but given the state of their roster and the state of Golden State’s, it was not going to happen. They always needed something to go sideways. In other words, this is still the best chance the Cavs will have at a title, and those chances maybe aren’t as diminished from earlier this season, or last season, as it seems. natesilver: (If you use a system like Basketball Power Index that doesn’t include a playoff boost, the Cavs’ odds of winning the title are … 0.2%). kyle: That said, they should definitely try to trade LeBron for Kawhi Leonard and see what happens. natesilver: But what are the chances that Isaiah Thomas isn’t still complete trash by the playoffs? Or maybe that’s setting a low bar — but that he’s an above-average point guard (meaning very good offensively given his defensive liabilities). kyle: Low! But that doesn’t change the premise here. The question isn’t how much better the Cavs can get here; it’s whether improving this last-gasp roster with LeBron, who may leave this summer, is the best shot Cleveland has at a title. The alternative is tearing it all down and playing the lottery game, but that isn’t anything close to a guarantee at a roster that can mount even an empty challenge for the title. We’ve seen what rebuilding without LeBron looks like in Cleveland. natesilver: I guess I’m just assuming that he’s more likely than not to leave and that if he stays, he might only stay for a year. neil: What do you think those odds are, Nate, if you had to put a number on it? natesilver: I think there’s a … 70 percent chance that he leaves? I dunno. I’m not Woj. I just think there are other places where he’d be more likely to win a title and that he doesn’t have a lot to prove in Cleveland. kyle: I get that, but my argument here is that one playoff run with LeBron is worth several years of potential value, because certainty is very hard to come by and LeBron is as close to a sure thing as we’ve had. So if you can flip the Nets pick and Isaiah for, say, Kemba Walker, you should max out in your window. The bill will come due, but I think it’s reasonable to max out when you think you’ve got a shot, even a faint one. neil: Yeah, a lot of it depends on what we think the Cavs’ odds of winning this season are as currently constructed in addition to the odds that LeBron would return to Cleveland (which could happen! ), versus the chance that they’d be able to build a team as close to contending as this one using the Brooklyn pick plus whatever assets they get in a LeBron trade. Which I think is what you’re getting at, Kyle. natesilver: I think our odds showing them with only a 16 percent chance of winning the East are too low. But they’re really dysfunctional right now, they have a lot of work to do just get functional, they’re probably going to have to win a couple of road series just to make the finals … and then they’re going to have to beat the Warriors, or maybe the Rockets. kyle: Anyway, back to my Kawhi trade. LeBron and Pop! LeBron could make a pairing with LaMarcus Aldridge work! Remember that no-look Hammer pass that LeBron claimed he was the the only person in the world capable of throwing but actually Boris Diaw threw for the Spurs for years and years? Run that back!!! Also not for nothing, but Boris was a useful player in the league very recently, and he was essentially Washed-Up LeBron. I’m pretty sure LeBron could be 2015 Boris at age 60.
natesilver: Why would San Antonio do that, though? chris.herring: There’s a part of me that wants Bron to play out the rest of the season as a Cav and then just maneuver a way to San Antonio or Houston. kyle: So LeBron’s no-trade clause makes all of this very academic. But in the timeline in which this happens, it would be backchanneled that he’d stick around a while. And IF the rift between Kawhi and the front office is real and IF Kawhi’s mysterious leg injury persists … Pop still tells Cavs owner Dan Gilbert to eat dirt, but it would be fun. And in theory, it would get him down there under the cap. chris.herring: I don’t think he would truly elevate anyone to championship level this year, aside from maybe Boston. The gap is too wide between the Warriors, the Rockets and everyone else. neil: And that factor is a big part of any LeBron trade — since he has the no-trade clause, as you mentioned, Chris, he basically gets to choose what situation would be best for winning over the rest of this season. That’s … not terrible, right? kyle: I don’t think the Bucks make sense at all, tbh. There’s a ton of duplication of skills with Giannis Antetokounmpo, and Giannis isn’t developed the way Dwyane Wade was in 2010 to play next to LeBron as a non-shooter. natesilver: But they’re getting 2018 Wade in the deal! Return to Milwaukee! I agree that they have overlapping-ish skill sets (which is a very, very nice thing to say about Giannis). But if the Bucks already had LeBron and you could clone him — well, you’d give up Jabari Parker and Khris Middleton and Thon Maker and Matthew Dellavedova for that, wouldn’t you? kyle: That’s the same reason the 76ers don’t really work. Joel Embiid is an amazing fit, but Ben Simmons not being able to shoot past the length of his arm is a tough, tough sell. Look at the players who have thrived next to LeBron — aside from Wade, who turned into a killer off-ball cutter and could always get to the rack, there isn’t really another guy who thrived with James without an outside shot. LeBron teams just run the LeBron offense, and a star like Giannis or Simmons doesn’t really fit that mold. In a way, the Bucks would be better off keeping Jabari and Middleton in that deal and finding another way to get value for Giannis. natesilver: Are you ready to get trolled? Here’s my next idea. natesilver: It’s basically the Arizona Wranglers-Chicago Blitz franchise swap option. chris.herring: I will say this: We don’t exactly know how Gordon Hayward comes back. And he hasn’t shown to be someone you can run your offense through. It grinded my gears last year that Iso Joe Johnson was Utah’s end-of-game shot taker. neil: I just wanna see the look on Kyrie Irving’s face when that is announced. chris.herring: Exactly! Kyrie would throw a hissy fit if that happened. He just ran away from that situation. So you can’t deal for a guy that would put him in that scenario all over again. natesilver: You can also include a Al Horford-for-Love swap if you want as part of it — the salaries work out. But, seriously, I’m curious — does the destination in-season have to be the team LeBron would be interested in re-signing with? How would the return package change between a team that thinks it can hang onto LeBron past 2018 and a team for whom he’s just a five-month rental? natesilver: I guess I’m thinking back to the Carmelo Anthony precedent — where a team would pay a lot to “lock him in.” Maybe a big premium over fair market price. 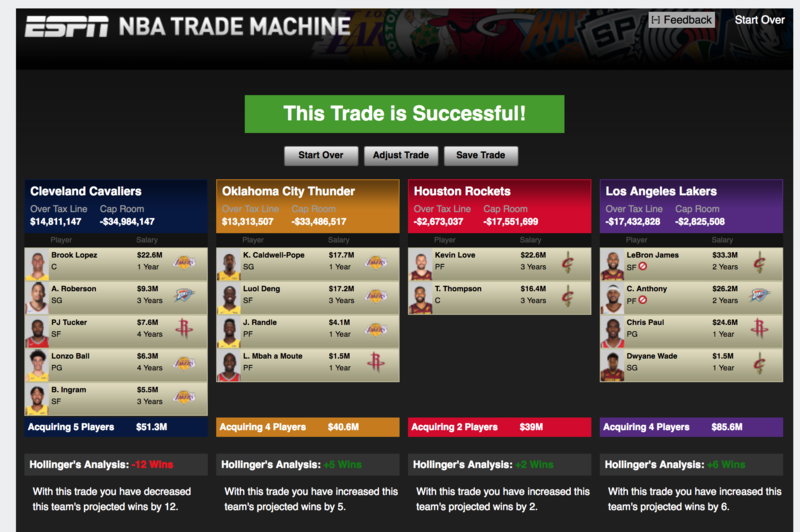 chris.herring: Kind of like the Rockets just did with Chris Paul, before he hit free agency? kyle: OK, here’s an actual (and still idiotic) idea: If Cleveland is going to trade for a Boston guard, it should target Marcus Smart. Cleveland’s defense is awful. Marcus is a one-man defense. Boston very likely can’t pay Marcus this summer. Given Cleveland’s needs, Smart makes as much sense as a microwave scoring option to replace Kyrie one-to-one. It’s just much harder to justify spending assets on him to your fans and owner. natesilver: But Cleveland doesn’t really have needs anymore if they trade LeBron, right? Or at least, not short-term needs? kyle: If Cleveland trades LeBron, its short-term needs include riot gear and tarps for the 300-level. neil: What’s incredible is that even after all of their struggles, the Cavs are still quite likely to make the playoffs. So basically this would have them limp into the postseason as a hollowed-out zombie version of a team, while some other team actually trying will miss the playoffs. kyle: This is a real thing, though: Building in a small market is HARD. This is why teams like the Pistons take such big risks just to get a guy like Blake Griffin or why Memphis paid Mike Conley and Marc Gasol knowing the clock was up on that core. Things worked out, eventually, for the Philly teardown, but even those guys, good as they look, are playing .500 ball in the East at the stage Penny Hardaway and Shaquille O’Neal were making the finals. If the Cavs parachute out of the LeBron era, they have to be VERY certain that there’s no chance whatsoever this season and that LeBron is very, very likely to leave. chris.herring: I honestly think he’d have to straight-up tell them he’s gone. Anything short of that, and fans will never forgive you. We’re a site that deals in probabilities, but no fan would give a damn about that. natesilver: I mean, I feel like we’re going in circles here. Let’s say the Cavs have a (i) 5 percent to 10 percent chance to win the title this year; (ii) 70 percent chance that LeBron leaves this summer; (iii) a further 70 percent chance that LeBron leaves next summer, even if he’s still here this summer. And let’s say you can get a potential franchise talent — not a Ben Simmons level talent, but say Donovan Mitchell or Ingram — in return. chris.herring: All it would take is LeBron saying 20 years from now that he never wanted to leave, and Dan Gilbert would get threatening letters in droves for a decision that actually seemed wise at the time. neil: That’s the thing with LeBron — he loves to keep his options open. This is the kind of thing that all parties might be able to get behind IF they all admit this season is a wash.
natesilver: Yeah, if LeBron went to the Lakers this year, part of the idea might be that he’d get to take the playoffs off or maybe even end his regular season early (unless they won like six in a row or something). kyle: It clears the decks for LeBron in LA salary-wise, moves one but not all of the young talent, and slots in LeBron with Lonzo, Kyle Kuzma, a possible Julius Randle re-signing (haven’t done that exact math) and another free agent. 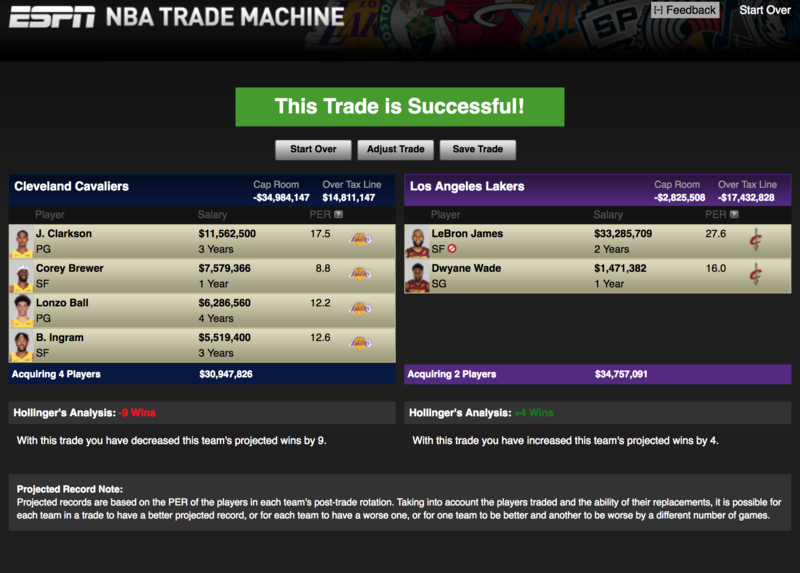 tchow (Tony Chow, video producer): Jumping in late here, but if we’re doing Lakers trades, I’m just going to leave this here. TEAM BANANA BOAT! natesilver: Wait, what is happening? I can’t even process it with all those colors. kyle: The Lakers would win 25 games. This makes some sense from both sides if you think about it. kyle: The Cavs add rebounding and passing in the frontcourt and youth in the backcourt. neil: LOL. I think we’re done here.